Welcome to the Materials and Manufacturing Technology (MMT) graduate concentration at The Henry Samueli School of Engineering. This school-wide graduate program leads to an M.S. degree or Ph.D. degree in Engineering with a concentration in MMT. It also offers a part-time study option for students pursuing an M.S. degree. Currently, there are 25 faculty members from five departments (CEE, BME, ChEMS, EECS, and MAE) participating in this interdisciplinary program. Given the nature of Materials and Manufacturing Technology as an interdisciplinary program, students having a background and suitable training in either Materials, Engineering (Biomedical, Chemical, Civil, Electrical, and Mechanical), or the Natural Sciences (Physics, Chemistry, Biology, Geology) are encouraged to participate. Recommended background courses include an introduction to materials, thermodynamics, mechanical properties, and electrical/optical/magnetic properties. A student with an insufficient background may be required to take remedial undergraduate courses following matriculation as a graduate student. 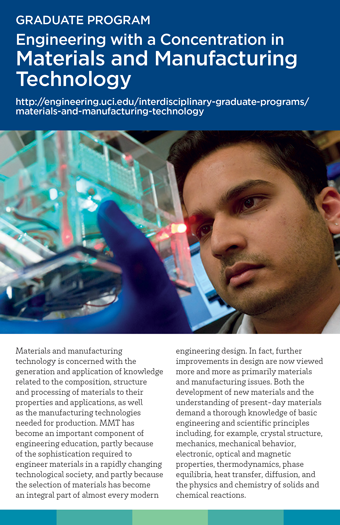 Subjects of interest in Materials and Manufacturing Technology cover a wide spectrum including metals and alloys, electronic and optical materials, ceramics, advanced composites, polymers, biomaterials, electronic packaging, solder technology, microfabriaction, semiconductor processing, various sensors, lifechips, and nanotechnology. The emerging new research and technological areas in materials and manufacturing technology are in many cases interdisciplinary. Accordingly, the principal objective of the graduate curriculum is to integrate a student’s area of emphasis—whether it be chemical processing and production, electronic and photonic materials and devices, electronic packaging and manufacturing, or materials engineering —into the whole of materials and manufacturing technology. Such integration will breed familiarity with other disciplines and provide students with the breadth they need to face the challenges of current and future technology. The field of MMT ranks high on the list of top careers for scientists and engineers. The services of these engineers and scientists are required in a variety of engineering operations dealing, for example, with design of semiconductors and optoelectronic devices, development of new technologies based on composites and high-temperature materials, biomedical products, performance (quality, reliability, safety, energy efficiency) in automobile and aircraft components, improvement in nondestructive testing techniques, corrosion behavior in refineries, fabrication of steels, and construction of highways and bridges. Southern California has one of the largest manufacturing bases in the world. The materials and manufacturing industries include: aerospace, automotive, biomedical, communications, construction, defense, electronics, food processing, machining, medical instruments, metallurgy, oil refinery, pharmaceutical, optics, semiconductor, and tools, etc. The opportunity for the graduates to find a position is high. The pursuit of advanced manufacturing technology is critical to keep manufacturing activities and jobs here. This needs the talents of the engineers and the workers to design and implement cost effective manufacturing processes.